For painting and rolling in and around the house. Safe, easy and economical. Everything in one hand! 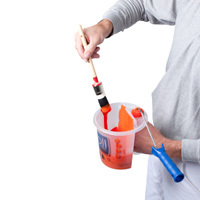 The Roll and Go is very handy painter’s tool for everyone who paints. Everyone who has worked with a flat roller tray knows the inconveniences of the tray: it is always a balancing act with the tray. If you are standing on the stairs, the lacquer tray has no room to stand or hang. Or you keep having to bend over when you are painting in order to dip the roller or brush into the flat tray. Rolling The shape of the Roll-and-Go is round with a vertical rolling surface and a hollow handle. This allows for optimal rolling and the paint flows back into the paint tin in an optimal way. When you take a break you can rest the roller in the hollow handle. 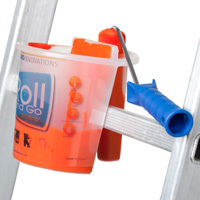 The Roll and Go is always easy to hold (for smaller hands as well), it stands stable on a flat surface and can be hooked onto (whether in a metal paint kettle or not) the rung of a ladder. You always have the paint to hand, close to the painting work. The Roll-and-Go allows you to continue working with ease, even when you are standing on a ladder. Painting The sharp rim on the Roll and Go allows the paint to be skimmed off the brush well and the paint flows back into the paint tin fully. You can work with a roller and a brush from the Roll and Go at the same time without having to put anything away. You have paint, roller and brush in one hand. Whilst you work with the roller, your brush rests in the hollow of the handle, or vice versa. The rolling or painting is no longer interrupted to fetch a brush or paint. Storing You don’t have to remove your roller from the handle in order to store your roller, but you can store it with the handle in the hollow of the handle. Even better is to put the roller in the handle with a bag around it and to then cover the star in the lid with a piece of tape. Your brush also fits perfectly into this hollow. Do not pour your paint back into the paint tin: put the lid on the Roll and Go and you can still continue painting after 5 days. Paint, brush and roller are saved together in one tin.